I’m a little late with my ‘Blogger Tips’ post this month but between going away and a generally busy April, I really wanted to spend some time on this one and not rush it! 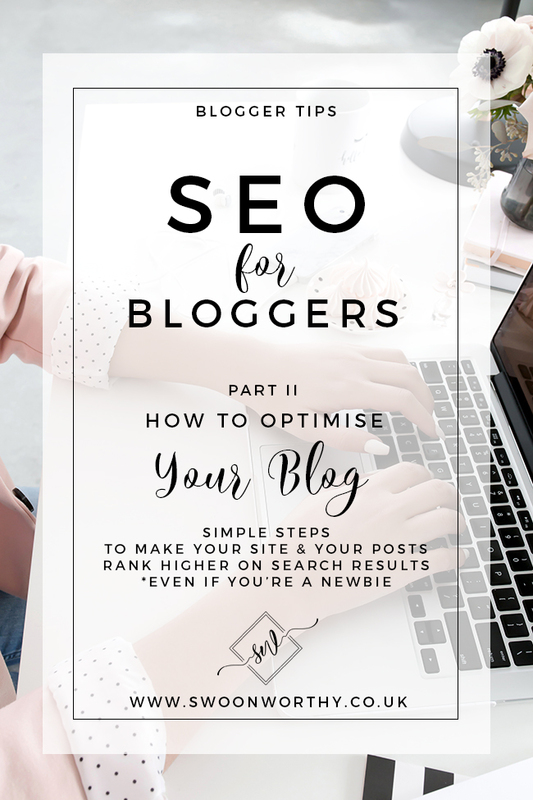 This is part II to ‘A Bloggers Guide to SEO’ and if you haven’t read the first part, I would encourage you to please do so here. 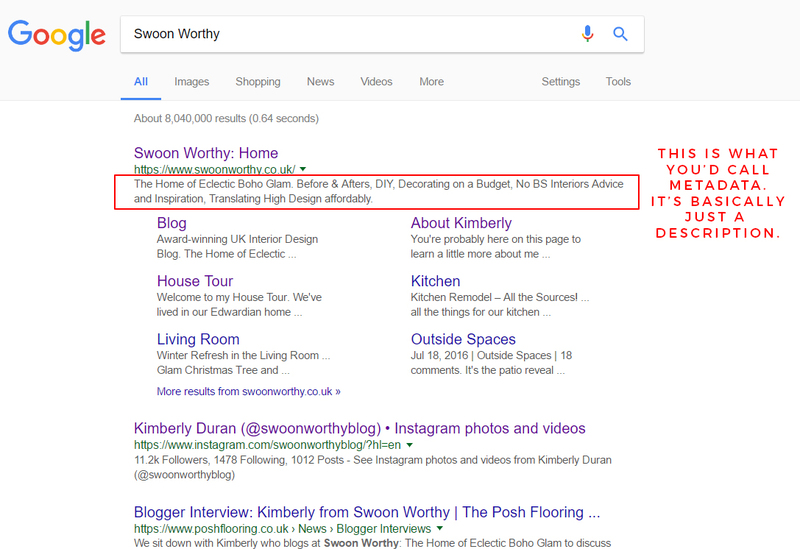 It will give you a little background on WHY you should be optimising your blog for search and not just some steps that mean nothing without that context. A long time ago when Google was still new on the scene, it was a bit like a toddler knocking about, exploring the world, trying to make heads or tails of what it was looking at on millions of websites around the globe. Everything was really basic because it was young and inexperienced. So it would look at various words on a website or it would look at links and say, ‘Okay yep, got it, this is what this website is about!’ and serve up search results based on its findings. Except that ACTUAL humans were a little savvier than Google. Unscrupulous people tricked ‘baby Google’ into thinking that websites were higher quality than what they were. ‘Black Hat SEO’ came on the scene where people were manipulating the search results that were really only intended to rank but didn’t actually provide any useful content to a human audience. Not only were they stuffing their content with keywords to rank in the search results, they were creating things like ‘link farms’. These were basically just garbage websites with long indexes pointing to lots of different sites to boost a number of links they had. Remember the last post about how links work? Yes, they were cheating the system using links along with lots of other things that were pretty unethical. And unfortunately, at the time, they were succeeding. It meant that a user’s experience with Google ended up being pretty crap. Bad times for Google. So fast forward a few years (and many algorithm changes later) and Google grew up and grew wise. While people still use some crappy tactics to try and trick Google, Google has gotten better at recognising unethical behaviour and will ban those websites from even appearing on the search engine at all if it tries to manipulate the search results. The good news is, there is much less chance of getting rubbish search results when you type in your query in that little search bar. We’re a good few years on since those early ‘toddler’ days of Google – it’s more of a know-it-all teenager now. It’s figured out a LOT of stuff. It’s gotten pretty damn smart in fact. But it’s still not perfect. It’s still not a fully-formed adult. So it still needs a bit of help. And this is where optimising your posts and your site comes in. Does your content actually solve a problem? So let’s talk about content first because this is genuinely the most important thing when it comes to ranking on Google. You need to be creating good quality posts that people actually want to read and really, this is the biggest factor when it comes to where you end up in search results. When I say ‘content’, I’m basically just talking about the meat of your blog – the information you present in blog posts. When you create your blog posts, you want to consider how you are answering a question that someone else might ask. Let’s say, for example, you just swapped some cushions from your bed and put them on your living room sofa. You really love how it looks, you’ve taken some pictures and you want to share that with your readers. You can, of course, just wack it on your blog but a post like that is not particularly helpful in the grand scheme of things. So instead, think about angling your post in such a way that it helps others. So, instead of naming your post “The Great Cushion Swap of 2017”, you could instead consider framing the post in another way. 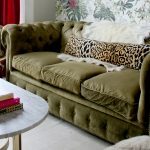 Maybe something like ‘How to Refresh Your Room in 2 Minutes Flat’ or ‘How to Add Colour to a Neutral Sofa’ or even ‘The Best 5 Ways to Update a Space Without Spending Any Money’. While the basic information will stay the same, framing your posts within the context of answering someone’s question will mean that when people are searching for answers (“how to refresh a room quickly”, “how to add colour” “how do I update my room for free”), it is more likely that your post will come up in search results. It also just makes for more interesting reading because your readers are actually learning something. Any mention of “keywords” used to send shivers down my spine. The idea of stuffing a blog post full of specific words and phrases felt unnatural to me. Perhaps it was because it reminded me of years ago (remember the Google toddler analogy?) when people just repeated the same keywords over and over all over their website simply to rank higher for certain words or phrases. It was obvious what they were doing and didn’t look at all natural because, well, no one speaks like that. The good news is that Google – as I said – has gotten smarter. It actually now knows that certain words and phrases might be synonyms. That if you do a blog post on ‘Top 10 Scary Movies’ that you probably don’t need to use the phrase ‘scary movie’ 42 times in your post. 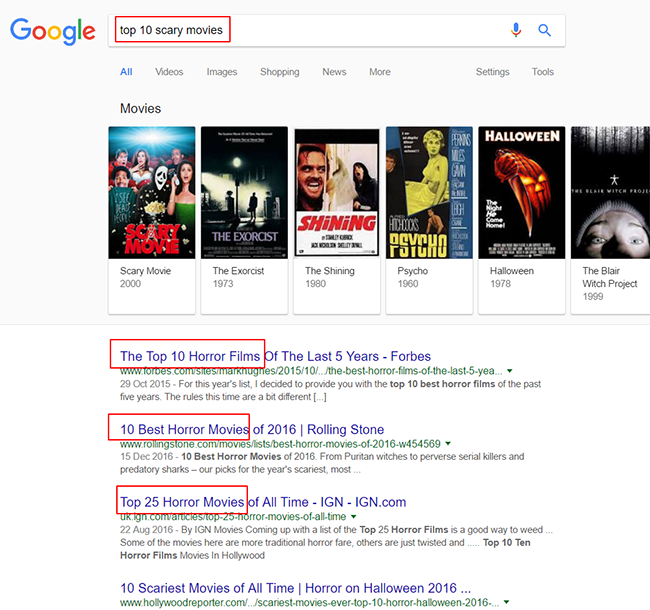 Google knows that ‘scary movies’ and ‘horror film’ are the same thing – clever right? It uses contextual relevance to understand that sometimes we might use different words or phrases to mean exactly the same thing. So that’s useful to know when you are creating your posts. If you want to rank for a certain phrase, by all means, use it in your posts. While you should be considering what phrases you’d like your posts to rank for, try to do it in a natural way. Don’t stuff your content with the same word over and over. Using it, say 4-5 times within 800-word post is absolutely fine. But using it every other sentence is going to flag to Google that you are keyword stuffing and it’s not going to like that nor will anyone reading your content. Also, consider using synonyms for commonly searched phrases or words. It could help for Google to understand the context of your blog post in the long run. Does it matter how long my posts are? Long ago, people used to say that there was a magical word count that blog posts should be. Normally it was somewhere around 300-700 words but no longer than that. The reason for this is because it was assumed that most people didn’t like to read long blog posts. They wanted something they can read in a few minutes and move on to the next thing. Short attentions spans, instant gratification and all that. With more research, it was found that that reasoning was flawed. Now, if someone is rambling on incoherently for 20 minutes, well, no one wants to listen to that. And the same applies to your posts. There’s no point in going on and on for hours over something that can be covered in a relatively short post. HOWEVER, there is an exception to this. Apparently, Google (and people) like it when you can dive deep into a subject matter. If you can really get into a specific subject and really delve into the depths of whatever that topic is, people will keep reading. They will want to read more and won’t just stop and lose interest after the 300-word mark passes (to prove my point, you’ve just read over 1000 words already thank you lovely reader). But it’s got to be good quality content, it has to be written well and it needs to be well structured. It has to really get down to the nuts and bolts of a topic and it needs to be explored thoroughly and insightfully. One other factor is that if you have a longer blog post (over 1000 words), you’ll naturally use your keywords more often, you’ll probably use more images and the subject matter of the content will be clear for Google to understand. Under 300 words and Google doesn’t really have enough information to index particularly well. The more in-depth the content, the greater the chances of Google ranking it higher in search results. So while you may want to keep your normal blog posts within that 300-700 word mark, if you are exploring a topic that requires more than that to really get into the meat of a subject, then go for it. Just spend some time to ensure it reads well and it’s easy to understand. What the hell is Metadata and why do I need to worry about it? Here’s where a lot of people glaze over. Metadata sounds like something from a Sci-Fi film. But what it actually is just a description. That’s it. You are basically describing what something is within the context of your website. That’s not so bad, right? But you might be asking why you need this? Well, remember when I talked about Google going in and indexing your site? It sends all these little robots and spiders to search your content to try and form a bit of a picture and it runs back to Google with that information. Metadata gives Google information about the topics you cover and it gives people a reason to click on your blog if they are searching for the topics your blog covers. It tells both Google and people seeking your content, ‘See my blog? Yeah, this is what it’s all about’ or ‘See this blog post? This is what the blog post is all about.’ That’s basically all it is. It helps our teenage Google to be able to look at something really quickly and just get what it’s looking at immediately. It also will bring more eyes to your blog or blog posts when people know immediately that your blog will provide the answers they are searching for. 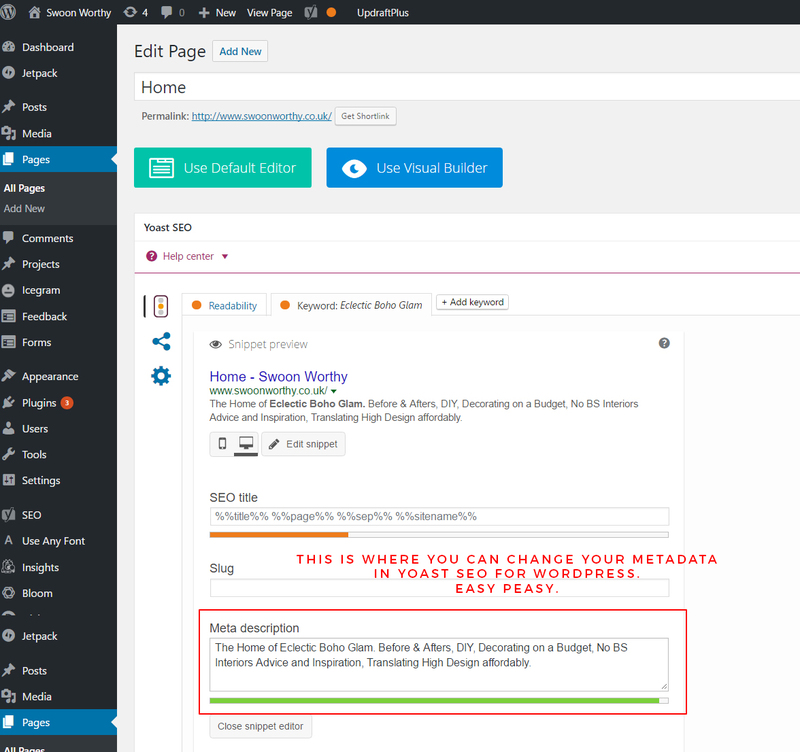 Once you install the plug in, you can go to SEO > Titles and Metas > Homepage > Editing the Front Page Itself to update your site’s meta description. Or you can click on to your pages, scroll down and edit the metadata there. When writing your metadata, consider using keywords that you might want to rank for within this and use natural language that would encourage a visitor to click on your site. What the hell is Alt Text and can’t I just ignore it? Another weird phrase that makes people gloss over. Alt Text is similar to metadata in that it’s just a description but instead of it describing content, it’s describing an image. A picture is worth 1000 words, right? Except that in Google’s slightly untrained eye, it needs a little help in terms of what it’s looking at. If you upload all your images with IMG2017.jpg, that actually doesn’t tell Google anything about what’s actually in that picture. If you use descriptive terms (like the keywords you’d like to rank for!) in your images, however, Google will understand what the image is. It’s pretty easy to change the alt text on any image in WordPress and you want to make sure you are using alt text in every single image. Your images descriptions don’t have to be long but they should either describe what’s happening in the image or what the image links to in terms of the content it’s related to. So this is why I’d highly highly recommend Yoast SEO plugin for WordPress. It basically does all the analysis for you and will let you know if something isn’t great. 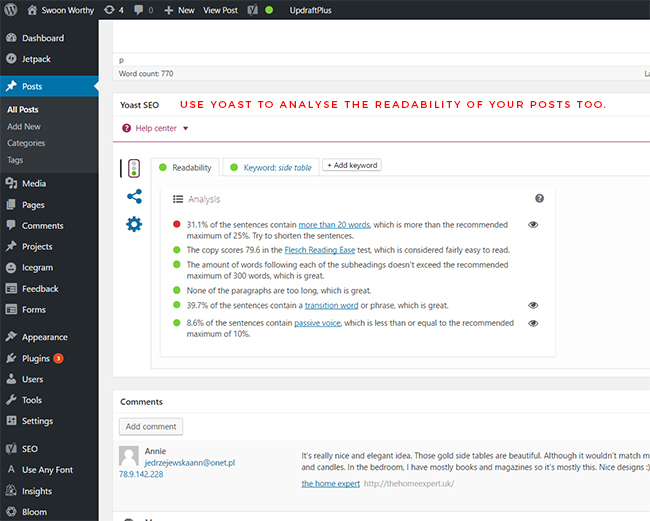 It basically grades a post on a whole bunch of different factors then gives you a ‘red light’ if you should make a lot of improvements, a ‘yellow light’ if you just need to make a few tweaks and a ‘green light’ if your post is pretty spot on. You can easily edit your metadata, you can choose a focus keyword that you’d like to rank on and then check the analysis on the post. It will tell you where you can make certain adjustments to your post to get it to rank higher, looking at it through the eyes of Google. You can also click on ‘Readability’ which will track things like how long and rambling your sentences are, how many sentences use the passive voice, if your paragraphs are too long and should be broken up, etc. I admit, I don’t pay as much attention to that one and it’s rare I get a green light! What can I say, I like my passive sentences *wink wink*. However, it is good to keep an eye on all that as well. Here’s another thing I touched on in my last post and it’s important here too. If you have your own domain and hosting, Google will see this as better than if you don’t. It holds more authority and looks more professional in Google’s eyes. You can get hosting and your own domain for very little money. It’s completely worth every penny. The last thing people want is a site that takes forever to load or gets stuck half way through loading. You want your site to be quick and you want your site to be easy to view no matter what device people are using to look at it. When you are choosing a theme for your website, make sure it’s fully responsive. What this means is that no matter what size the screen it’s viewed on – from a large monitor to a laptop to a tablet and to a mobile device, the site looks good and makes sense to get around. Of course, I could go into a lot more detail about any one of these topics but these are the basics that I try to apply when creating content. There are so many other things you can do to optimise your site for search, of course, but I didn’t want to bog you down too much in detail so I’m hoping this overview is helpful! Did you find this short series on SEO helpful? Are there any other topics that I didn’t touch on here that you’d like to know more about? 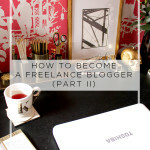 I’d love to know what else you’d like to see in my Blogger Tips series so any suggestions are welcome! The comment box awaits! Oh! Oh! I went over and changed my metadata IMMEDIATELY once I saw how easy it was to change! Good god, mine has been showing up as the first few lines of my latest blog post for 5 YEARS. And more recently, it’s honed in on Cora’s birth story 😅 Not interiors or DIY at all! I was so excited when I read that (I think) I’m already doing alt text – I just rename all my photos with descriptions along with the name of my blog. And I have my own domain name! AND my theme doesn’t take too long to load! I feel like the snotty kid at the front of the class! 😂 Though I still have LOADS of work to do still on my site. I have to sort out my no-follow links, work on making my blog titles less cheesy and more Google-friendly, oh and I want to make an impressive media pack. Your site may crash. I am loving this series! It’s just so useful and helpful! My blog is just a hobby blog I do outside of my full-time job, but I’ve been really looking into increasing traffic lately and trying to make a bit more of it, so this series is just what I need right now! I actually only recently started doing the metadata thing. I’ve had my blog for six years, and I hadn’t even had a proper metadata description of my blog – and it takes no time to do! I wish I’d read this before and got my bum in gear earlier!! I also started with the alt descriptions, and I don’t know why I was too lazy to do that before too! I need to think about your suggestion on getting my own domain name. 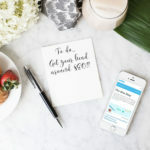 When I first started my blog, I bought the dinki dots name but I never actually did anything with it – I carried on blogging through Blogger, then after 2 years I didn’t bother renewing it. Because I keep banging on about finding a name I prefer, I’ve not wanted to buy a domain until I’ve found the perfect new name! But I think I should maybe get a move on, especially if it holds more sway with Google. This is a really useful post to bookmark! I’ve been thinking of swapping over to Yoast, so reading this has made me go for it – thank you! Very informative Kimberly. Easy to read and some really great tips. 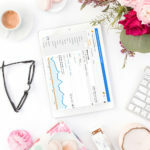 Very good post with useful tips, thank you :-) I’m very glad that google grow up and now content and good blogs are SEO-winners . I consider that social activity is important too and have some impact on SEO. Great post. I am now myself carrying out my website’s seo and sometimes you can get lost. Thanks for your guide. Beautiful blog! Great reader friendly series. Would it be possible to do a post on images in posts? I don’t even have a blog at have still found this interesting, great writing! And, I cheat – I use the alt tag for accessibility and the title tag for SEO. Then I get the best of both worlds. Kimberly! This post is MEGA! Having *just started* my blog, this was such an eye opener for me – and I’ve since installed Yoast. All of your Blogging Advice is broken down and written so clearly – it beats watching some tech nerd on YouTube anyday.